You know the drill. It happens every evening in our house. In our case, we had some fresh chorizo in the fridge. We had just been to Dubrovnik Butchers in Bayswater. If you live in Perth and are partial to European sausages, you should check them out. All their sausages are made on the premises. I particularly recommend the chorizo. We usually buy the smoked chorizo but this time I thought I would give the fresh chorizo a try. Onto eatyourbooks I went and typed in chorizo. This time I got 70 hits. Maus had also said she didn’t want anything with meat in it, which is a bit hard if you are focusing on chorizo but that was a minor detail I was willing to ignore. 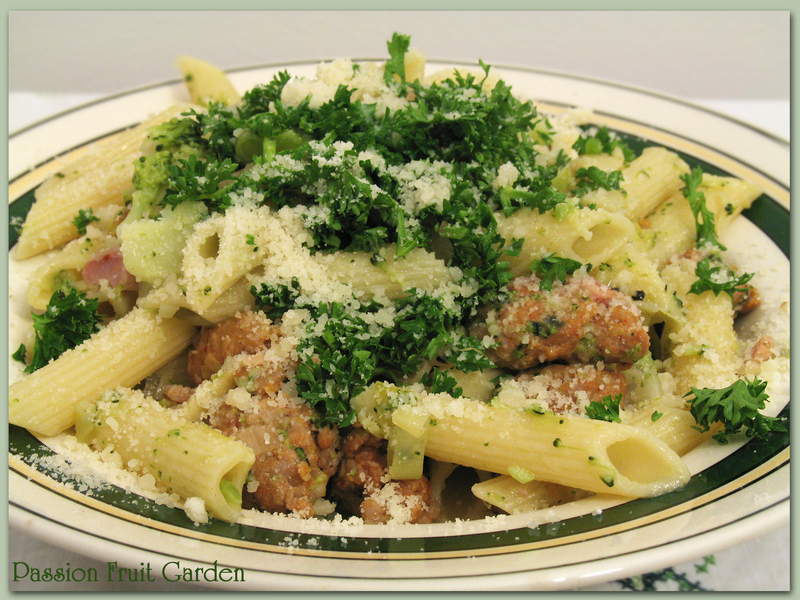 Before long I had zoomed in on Penne with Broccoli & Chorizo. I liked the sound of it because I love my broccoli, there wasn’t too much meat in it and the recipe specifically called for fresh chorizo. The recipe says it serves 4, but it will easily serve 6. Maus said it tastes better today than yesterday. I though it tasted pretty good yesterday: so there you go. The recipe is by Kathy Snowball. It appeared in Cuisine Magazine: Issue 140, May 2010. Cook the pasta and broccoli in salted water until the pasta is al dente. Drain. Meanwhile, in a saucepan heat the oil and fry the leek, pancetta, garlic and chorizo over medium heat until the leek is soft and the chorizo is cooked. Toss the pasta mixture with the chorizo mixture and serve topped with parsley and parmesan. This entry was posted in Broccoli, Eating your bounty, Pasta and Rice, Something Simple, What's for dinner? and tagged Dubrovnik Butchers Perth, Fresh chorizo by Glenda. Bookmark the permalink. Why not a Balkan chorizo? Chorizo is chorizo is chorizo! If one goes into a well stocked modern grocery in urban Mexico nowadays, there are so many different types of chorizo, it’ll make the head swim. Of course, most are simply misnomers of other kinds of sausage – I suspect the word chorizo in Mexico is generic for all sausage. I think one is safe knowing what to expect with Spanish chorizo, but not so when faced with Mexican chorizo. Well I’ve been to Dubrovnik, Croatia, a couple of times and chorizo is certainly not a ‘typical’ sausage in that part of the world. The ‘cevapcici’, a skinless paprika flavoured sausage is the principal sausage of that region. Have you tried them? They’re delicious and they go so well with onions, fresh bread and a vinegary cabbage salad. Typical Balkan fare. Hi Mariana No I haven’t tried them. We also bought some kransky but we haven’t tried it yet. Chorizo is just one of many items they sell. Well you have the Polish covered with the Kransky and Spanish with the Chorizo. You must taste a little bit of the Balkan region and try Cevapcici – sometimes spelt the Aussie way as ‘chevups’. Next time I go I will see if they have any. Yes I can see it, and looks so yummy…..
Hiya Regina. It is very nice and very simple.